The Montreal Canadiens have traded Michael Chaput to the Arizona Coyotes in exchange for Jordan Weal. The deal is straight up, giving both forwards a fresh start with a new organization. Chaput will report to the Tucson Roadrunners, while Weal will join the Canadiens directly. After the news that Christian Dvorak’s return is imminent, there wasn’t much room left for Weal on the Coyotes’ roster. The team would have had to waive him to send him to the minor leagues which may have risked him for nothing, though his $1.75MM contract might have been tough to swallow for another team around the league. Weal has shown some real upside over the years, but has just 11 points this season and has now been traded twice. The 26-year old is scheduled to become an unrestricted free agent at the end of the season, but will try to add his speed to a Montreal team heading to the playoffs and make enough of an impact to draw an extension offer. Chaput meanwhile has just five points in 32 games for the Canadiens this year and already cleared waivers to go to the minor leagues. The 26-year old will provide some excellent scoring depth for the Roadrunners, but is also signed through the 2019-20 season at league minimum. If the Coyotes did not intend on retaining Weal, they likely swapped him out for whatever they could get. Thursday: Friedman reports that Frk has indeed cleared waivers. He is expected to be reassigned to the AHL’s Grand Rapids Griffins. Not expected to be in demand on the trade market, the Red Wings’ next decision regarding Frk is likely whether or not to make him a qualifying offer this summer. Wednesday: The Detroit Red Wings are over the Martin Frk experiment, at least for now. The team has placed the 25-year-old forward on waivers, writes Sportsnet’s Elliotte Friedman, and this isn’t the first time. Frk was lost on waivers by the Red Wings early in the 2016-17 season, only to be reclaimed later when the Carolina Hurricanes also placed him on waivers. Will he survive the wire this time around? Limited game action and production could suggest so. Although Frk has earned one-year extensions from Detroit in each of the past two seasons, he continues to be a difficult player to figure out. A 2012 second-round pick, Frk is known for his heavy shot and offensive instincts, but lacks the skating ability and awareness to put himself in scoring position often. Frk found some success last season, recording 25 points in 68 games, but has been limited to just 25 games, minimal ice time, and a resulting five points this year. At 25, the question is whether there’s still time and coach-ability left in Frk for him to develop into a complete player. If another team thinks so, Frk’s offensive potential may be worthy of a claim. If not, a pass through waivers could be the first step toward the impending RFA being out of the league sooner rather than later. Meanwhile, Friedman adds that the lone player on waivers yesterday has cleared. Montreal Canadiens forward Michael Chaput went untouched on the wire and remains with the Habs organization. The team was quick to announce that Chaput has been reassigned to the AHL’s Laval Rocket. As expected, the Montreal Canadiens have placed forward Michael Chaput on waivers. The team needed to make a move after recalling Dale Weise and trading for Nate Thompson yesterday, and Chaput was the obvious waiver candidate. The Canadiens have shown a willingness to expose depth forwards to waivers this year, already losing Nikita Scherbak, Jacob de La Rose and just yesterday Kenny Agostino. The team clearly believes it has the depth to handle these losses given their recent additions, and have now risked another player. Chaput, 26, has actually played 137 games in the NHL during a winding career, 32 of those coming this season with the Canadiens. Originally a third-round pick of the Philadelphia Flyers, Chaput has just five points in 2018-19. Since Montreal used the non-roster designation on Chaput yesterday in order to get under the 23-man threshold, he must immediately be assigned to the minor leagues if he clears tomorrow. If that does happen, he very well could be back up with the team in a few weeks after the roster limits are relaxed. 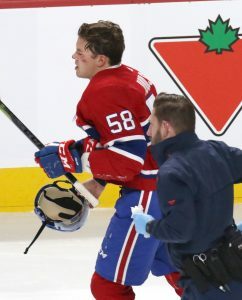 After taking two pucks to the face last night, Montreal Canadiens defenseman Noah Juulsen has been ruled out indefinitely with a facial fracture. He will remain in Montreal while the team heads out on their road trip and will undergo further evaluation. He and Nikita Scherbak have been placed on injured reserve, while the team has recalled forward Michael Chaput to fill one of the roster spots. Juulsen, 21, looks to have made the jump full-time to the NHL this season after splitting time between Montreal and Laval a year ago. That consistency had resulted in five points through his first 17 games, and increased responsibility for the team. In fact, in his last game before suffering the injury against Washington, Juulsen had logged over 20 minutes of ice time. Originally selected 26th overall in 2015, the former WHL standout has all the makings of a solid top-4 option for Montreal going forward. Unfortunately, key development time will now be missed as he works his way back from this injury. Chaput meanwhile will try to show that he can still be an NHL option after continuing his successful offensive play at the minor league level. A third-round pick of the Philadelphia Flyers back in 2010, Chaput has played just 135 games over his NHL career and none since signing with the Canadiens in July. He does have seven goals and ten points in 18 minor league contests this season with the Laval Rocket, but needs to translate that offense to the NHL if he wants to stay there. With the rosters coming into shape, some bigger names are starting to make their way to the waiver wire, according to TVA’s Renaud Lavoie. Today, 16 players were placed on waivers. After everyone cleared from Saturday’s list, will someone get claimed from today’s group? Kulak could be one of the more interesting players who could get claimed as the 24-year-old defenseman played 71 games for the Flames last season and has proven to be a solid third-line pairing defenseman for a team that might need some depth at that position. He was made expendable with the emergency of rookies Rasmus Andersson and Juuso Valimaki in Calgary. Aberg was also an interesting player, who never gained any trust with management in Edmonton after the Oilers acquired him from Nashville at the trade deadline. One big problem for the scoring winger is that he doesn’t really play on any special teams positions, which keeps him from being a quality role player. The 23-year-old Lazar is another interesting option if a team needs a depth winger. Unfortunately for the Flames, they never saw significant progression after the team traded a second-round pick (which turned out to be Alex Formenton) for Lazar, who only produced two goals and 12 points in 65 games last season. With their forward depth evident in training camp this year with players like Dillon Dube and Andrew Mangiapane playing well, Lazar was expendable. The Boston Bruins dealt with numerous injuries over the course of the 2017-18 season, but that didn’t stop the team from getting into the second round of the Stanley Cup playoffs last season. One injury that truly crippled the team was the loss of defenseman Brandon Carlo right at the end of the season with a broken fibula. While the team is solid on defense, the presence of the 6-foot-5 blueliner has been critical to their team. Boston Globe’s Kevin Paul Dupont writes that Carlo injury is fully healed as x-rays were clean and the 21-year-old has already been skating for more than a month. Not an offensive defenseman, Carlo has had trouble adjusting to the NHL physical game, having spent his rookie campaign next to Zdeno Chara and then being teamed up as the defensive presence to offensive sparkplug Torey Krug. However, Carlo said he’s added close to 10 pounds of muscle to his frame this offseason and is ready to take the bulk of another full campaign in Boston. While there are many people who feel that winger Brady Tkachuk, who announced his intention of going pro Saturday, might be better served playing with the OHL London Knights or the AHL’s Belleville Senators next year to continue his development, Bruce Garrioch of The Ottawa Sun writes that Tkachuk actually has as good a shot of anyone on the roster to make the NHL squad out of training camp. The team isn’t deep at the left wing position, which includes players such as Ryan Dzingel, Mikkel Boedker, Max McCormick, Magnus Paajarvi, Tom Pyatt and Zack Smith. Not exactly top of the line. Considering that Smith is likely to move to center next year and Pyatt could move to the right side, if needed, there is plenty of space for Tkachuk if he impresses in training camp. Historically, players picked at No. 12 in the NHL Draft usually don’t end up with their NHL time right away in their first season, but that could be a possibility when it comes to New York Islanders 2018 first-round pick Noah Dobson. The 18-year-old prospect showed off his skills with a dominant performance at the World Junior Showcase for Canada by posting five goals in three games. The Athletic’s Arthur Staple (subscription required) writes another impressive showing at training camp in front of coach Barry Trotz could force the team’s hand to keep him, considering the team’s lack of depth on defense. While the Montreal Canadiens didn’t make too many waves this offseason, the team did sign several smaller names, including Michael Peca, Xavier Ouellet, Kenny Agostino and Michael Chaput. The 26-year-old Chaput is an interesting case as he’s played 135 NHL games already in his career, but with the exception of a 68-games season back in 2016-17, the center has spent most of his career in the AHL. Now, with many openings potentially available in Montreal, Chaput feels he’s got a great shot a full-time role with Montreal this year, according to NHL.com’s Matt Cudzinowski. “My mindset is to try and make this team. I want to play for the Canadiens. That’s my main goal. That’s what I’m working towards,” said Chaput. The Montreal Canadiens have committed to making their AHL team better this season, and have signed three players who could easily contribute to that. Xavier Ouellet, Kenny Agostino and Michael Chaput have all agreed to join the Montreal organization on two-way contracts, with the former two signing for one season and the latter signing for two. All three will carry a $700K cap hit in the NHL. The team also signed Jesperi Kotkaniemi to his three-year entry-level contract. Ouellet was in the news recently as the 24-year-old was bought out by the Detroit Red Wings earlier this week. The blueliner was on the roster all season long for Detroit, but only saw action in 45 games and averaged just 13:51 of ATOI. With a large group of unmovable contracts on defense and some younger options to choose from, Ouellet became expendable and since he was just 24 years of age, a buyout would only pay him one-third of his salary. With Montreal on a two-way deal, he can provide both depth for the Canadiens, but also have a big role with the AHL Laval Rockets if he can’t make the team. For the third straight year, Agostino has signed a one-year deal with a new team only to look for a new job the following year. The 26-year-old forward has had trouble breaking into an NHL lineup after failed tenures in Calgary, St. Louis and now Boston. Agostino has only appeared in 22 NHL games since the 2013-14 season. However, he has been a solid AHL player over the past few years, which is likely what Montreal wants from him. He has scored 63 goals in the past three years in the AHL. Chaput was just recently dealt from the Vancouver Canucks to the Chicago Blackhawks for Tanner Kero, but Chaput who was a restricted free agent with arbitration rights, was not given a qualifying offer, making him an unrestricted free agent. With a two-year deal, the Canadiens plan to use the forward for depth purposes, but also to augment their AHL team as Chaput picked up 17 goals and 25 assists for the Utica Comets last year. However, he managed just nine games for Vancouver, although he did play in 68 game for the Canucks in 2016-17. As for Kotkaniemi, the third-overall pick in the 2018 draft signed his three-year entry-level deal with the Canadiens. The center will earn $832K with a $92K signing bonus, making his deal worth a total of $925K, according to Dan Braverman of NHL.com. The team selected Kotkaniemi over several other more highly regarded prospects including Filip Zadina and Brady Tkachuk, but the team was more interested in adding centremen to their franchise. He tallied 10 goals and 29 points in Finland’s top SM-Liiga league. The Chicago Blackhawks announced a small trade today with the Vancouver Canucks between two players who have been unable to crack their respective lineups as Chicago acquired Michael Chaput from the Canucks in exchange for Tanner Kero. Chaput has been a valuable commodity for Vancouver’s AHL team as he has bounced back and forth between the Comets and the Canucks. The 26-year-old forward tallied 17 goals and 25 assists last year with Utica in 55 games and only managed to appear in nine games for the Canucks, averaging 9:47 of ATOI and tallying no points. He did appear in 68 games in 2016-17, but couldn’t hold onto that job. With an influx of young talent pouring into the system, it appears that players such as Adam Gaudette or Jonathan Dahlen (unless they make the Canucks outright) will likely take over as top-line forwards for Utica, making Chaput expendable. A restricted free agent with arbitration rights, Chaput will need to be signed, but again provides a cheap depth forward that Chicago needs with all its bloated, high-priced contracts at the top of their books. Already with 135 games of NHL experience, he provides the perfect bubble addition for the team that has a lot of youth that may or may not be ready for Chicago next season. As for Vancouver, the team brings in Kero, who also has considerable experience playing between the AHL and NHL levels, but hasn’t been as successful. Kero tallied eight goals and 20 points in 36 games for the Rockford IceHogs last year, while he played eight games for Chicago, putting up a goal and two assists. He has 72 career NHL games under his belt. He provides value at the AHL level for the Comets, who need help at the center position there and he still has one year remaining on a $750K one-way deal. Free agency is now a little more than a month away from opening up and there are quite a few prominent players set to hit the open market while many teams have key restricted free agents to re-sign. Here is a breakdown of Vancouver’s free agent situation. Key Restricted Free Agent: F Sven Baertschi — Considered to be a player who could break out at any time, the 25-year-old restricted free agent never has had the opportunity as injuries have derailed any true success so far. Having already played in parts of seven seasons and three complete seasons, Baertschi has never played a full season or even close to that much (his season high is 69 games back in 2015-16). This past year, the winger only got into 53 games as he dealt with a jaw injury in December after being hit in the face with a puck and then separated his shoulder in March that ended his season. With 14 goals and 29 points, Baertschi has the potential to contribute to a young team if he can stay healthy. While the team will likely find a way to ink him to a one-year extension (he made $1.85MM each of the last two years), the team must also determine if he’s a core player who will be a major contributor on his team in the future. Another injury prone year could force the team to move on from him if he can’t prove that he can stay on the ice. Other RFA’s: F Reid Boucher, F Cole Cassels, D Anton Cederholm, F Michael Chaput, F Markus Granlund, F Griffen Molino, D Derrick Pouliot, D Troy Stecher, D Mackenze Stewart, F Jake Virtanen. Key Unrestricted Free Agent: F Darren Archibald — Archibald’s name suggests that the team has little to worry about when it comes to their own free agents. With just three NHL-level unrestricted free agents, Archibald’s value stands out. The 6-foot-3, 210-pound wing provides the team with grit, solid skating and physicality and has started to step up for Vancouver this season. A long-time AHL player, Archibald got into 27 games for the Canucks this season, putting up four goals and nine points and was a favorite of coach Travis Green and might be a cheap fourth-line option for Vancouver (he made $650K last season) rather than the franchise go out and sign a veteran for that spot. Other UFA’s: G Richard Bachman, F Nic Dowd, F Jussi Jokinen, F Joseph Labate, F Jayson Megna, D Patrick Wiercioch. Projected Cap Space: The team should have plenty of cap space if the team is ready to spend after the retirements of Henrik Sedin and Daniel Sedin. They have a little less than $53MM committed to players for the 2018-19 season and few contracts of their own that they have to deal with. 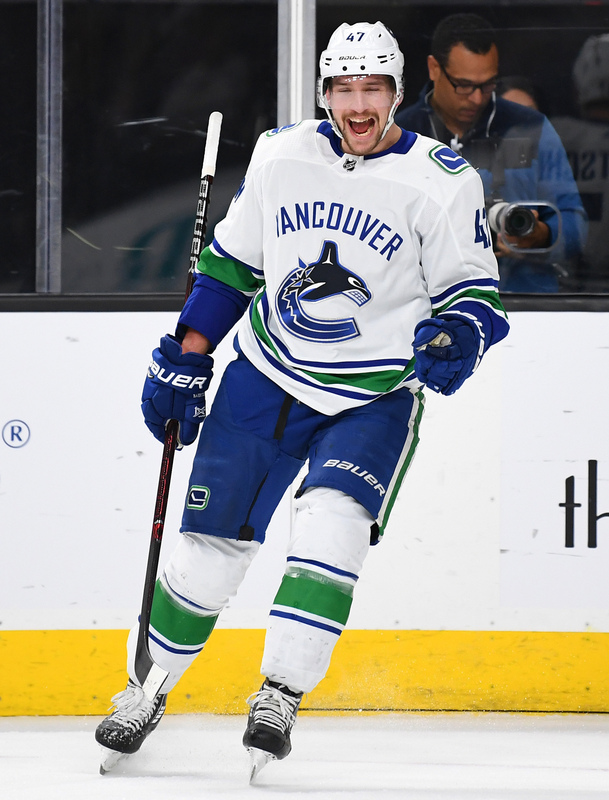 The team could attempt to add a few veterans to mesh with their young core of Bo Horvat, Brock Boeser and Elias Pettersson and must focus more of their attention on their defense, but they do have plenty of space to do that.